HUGE CONGRATULATIONS to @myles_mattila12 as he receives a $500 Scholarship from @HockeyCanada at the @HC_TELUSCup National Championship! If you don’t recognize the name Myles Mattila, you should get to a computer and do a search. While his Prince George-based Cariboo Cougars won’t play in the TELUS Cup final today (Sunday), Mattila is a winner because of his dedication to spreading the word on mental health. Why did Mattila get so involved in this issue? All because he noticed a few years ago that a long-time friend was struggling. On Saturday, Mattila spoke about mental health awareness at the TELUS Cup awards dinner in Prince George, where he is a Grade 12 student. He also received a $500 Esso Kids Scholarship Award from Hockey Canada. Remember his name. You're going to be hearing a lot about him down the road. Jory’s story about Mattila is right here. 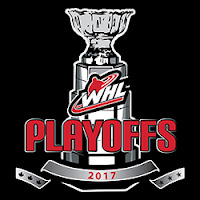 The WHL could have its Ed Chynoweth Cup finalists decided today (Sunday) when the conference finals resume. In the Eastern Conference, the Regina Pats hold a 3-2 lead on the host Lethbridge Hurricanes. 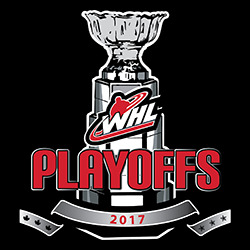 In the Western Conference, the Seattle Thunderbirds take a 3-2 edge into Kelowna to face the Rockets. The Hurricanes, who lost 5-3 in Regina on Friday, almost surely will be without F Matt Alfaro, a point-a-game skater who hasn’t played since April 4. F Ryan Bowen, meanwhile, has been in and out of the lineup; he was scratched Friday so obviously is banged up. The Thunderbirds continue to play without Rylan Toth, who led all WHL goaltenders with 36 regular-season victories. He hasn’t dressed for even one playoff game. In Toth’s absence, Carl Stankowski, a Calgarian who turned 17 on March 9, has gone 11-2, 2.60, .911. In the regular season, Stankowski played in 358 minutes over seven games, going 3-0-1, 2.18, .910. In the playoffs, he has played 785 minutes over 13 games. The Thunderbirds are likely to be without D Ethan Bear, who suffered an injury to his left hand when he blocked a shot by Kelowna F Reid Gardiner late in Game 3 on Tuesday. Taking Note has been told that Bear has a broken hand. Bear didn’t play in Wednesday’s 4-2 loss in Kelowna. He took the warmup prior to Seattle’s 5-3 victory in Kent, Wash., on Friday, but had difficulties handling the puck and was scratched. Obviously, Bear is a big loss for the Thunderbirds. After all, he put up 70 points, including 28 goals, in 67 regular-season games, and has 16 points, five of them goals, in 11 playoff games. But it could be that Kelowna misses D James Hilsendager almost as much. Hilsendager, who turned 20 on March 20, left in the first period of Game 4 with an undisclosed injury and was scratched from Friday’s game. He had three assists in 18 games with the Regina Pats, before being dealt to the Rockets for whom he recorded 24 points, six of them goals, in 46 games. In 15 playoff games, he has a goal and two assists. However, his value to the Rockets is much more than offence. In his time with the Rockets, he only improved. He has been a stellar defender who added a physical presence to their back end. It’s only right that Bear’s absence has gotten a lot of notice; after all, he was a fifth-round selection by the Edmonton Oilers in the 2015 draft and he has an NHL contract in his hip pocket. But could it be that Hilsendager’s absence will be just as impactful if he can’t answer the bell for Game 6? A run-in between F Tyler Wong of the Lethbridge Hurricanes and F Dawson Leedahl of the Regina Pats late in Game 4 of their series drew some attention but no suspensions. The two came together in a scrum at 16:15 of the third period of the game in Lethbridge and, when it was all over, Wong was claiming that he had been bitten by Leedahl. “It was in the heat of the moment. He made a mistake. I initiated some contact there. That’s part of hockey, the scrums. I hit him high and I feel bad. I’m not a cheap player. I don’t like hitting guys high. I’ll be physical. I’ll play on the edge. So does he. “He has laid out some big hits on me. I saw an opportunity to get a hit on him. My finger slipped in his mouth and, I don’t know if he meant to or not, but he took a good chunk out of my finger. I had to go and get a tetanus shot and go on antibiotics. That’s not really part of hockey and I think he would take it back if he could. Leedahl and Wong each was given a roughing minor and that was the end of it, at least as far as the WHL is concerned. However, Wong, a 51-goal scorer in the regular season, has only two assists in the five games against Regina, both of those coming in a 3-1 Lethbridge victory in Game 3. He hasn’t scored a goal since he got two, including the shorthanded OT winner, in the Game 7 victory over the Medicine Hat Tigers that vaulted the Hurricanes into the conference final. The Hurricanes are hoping their captain breaks out in Game 6 at home today. The Blainville-Boisbriand Armada advanced to the QMJHL’s championship final on Saturday with a 5-2 victory over the host Charlottetown Islanders. The Armada won that series, 4-1. . . . It was an emotional game for the Islanders because the father of Charlottetown F Dillon Boucher died on Friday night. “There’s always a bigger picture at play,” Charlottetown general manager and head coach Jim Hulton said in a story posted on the QMJHL website. “This is still a game and yeah, it hurts like hell that we lost, but not anything near the magnitude of what Dillon and his family are going through.” . . . The Armada will meet either the Saint John Sea Dogs or Chicoutimi Sagueneens in the championship series. The Sea Dogs hold a 3-2 lead with Game 6 today (Sunday) in Chicoutimi. Great Britain, including former WHL F Liam Stewart, beat Japan 4-0 on Saturday to win the IIHF World Championship, Division 1 Group B, in Belfast, Northern Ireland. With the victory, Great Britain earned promotion to Division 1 Group A for next season. Stewart, who played four seasons (2011-15) with the Spokane Chiefs, had two goals and an assist in three games. . . . Great Britain, which allowed only five goals, went 5-0, while Japan finished 4-1. . . . Croatia, under head coach Enio Sacilotto of the Victoria Royals, finished at 1-4 and was fifth in the six-team tournament. The Croats allowed only 17 goals, but struggled to score (14). . . . Lithuania beat Croatia, 3-1, in the third-place game. . . . Sacilotto is the Royals’ director of prospect development and has extensive international coaching experience.